Last week we looked at oil and considered the incredible freedom it gave artists to create staggering effects with paint. 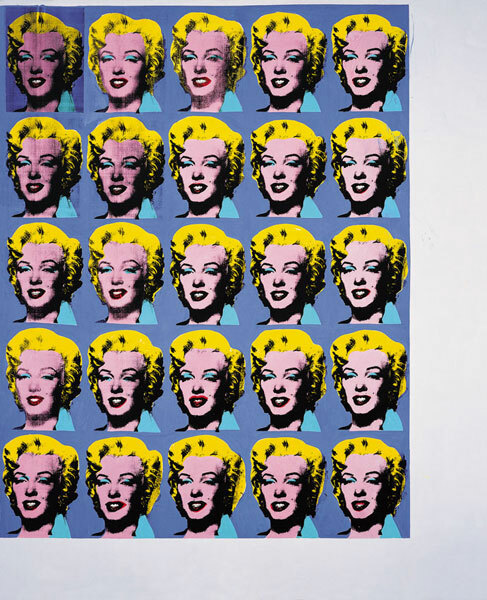 After centuries of oil dominating painting, acrylics came in from the 1940s and 50s. Acrylics changed the face of painting, altering how artists worked and how their works came to look. Made from pigment, acrylic polymer emulsion and chemicals that control texture, stability and durability, acrylics dry within hours. They can be thinned with water and used like watercolour or applied thickly like oils. Colours are available with different intensities and finishes: matt or metallic as well as opaque or transparent. As with other mediums, acrylic paint brings its own possibilities. One of its key advantages is versatility. For instance, like oil, acrylic can be used thickly. Here British painter John Hoyland (1934-2011) applies acrylic so liberally that its stands out in relief from the surface of the painting. 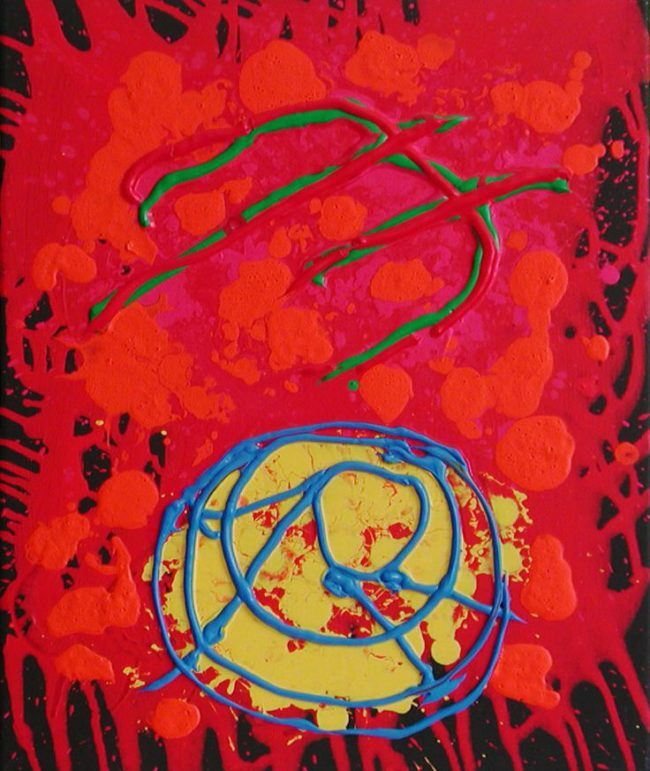 Impasto (heavy application) is typical of Hoyland and possible with fast-drying acrylic. Acrylic can also go the other way and be thinned and used more as a wash. 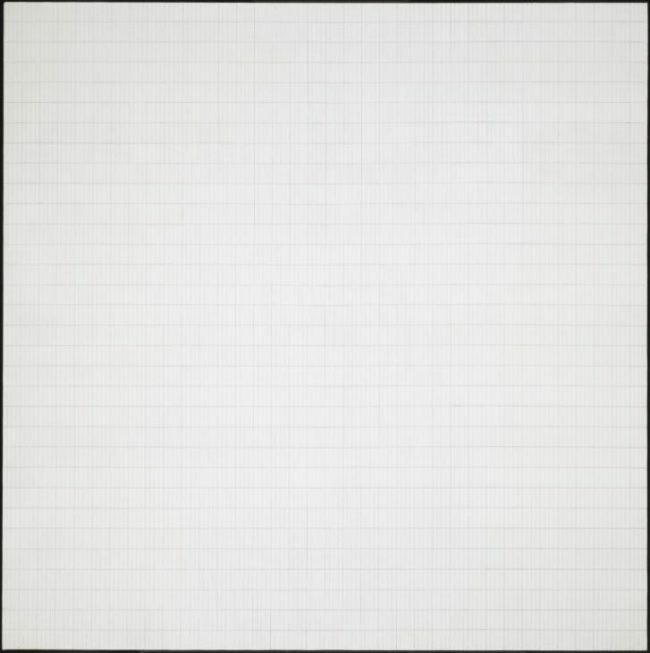 In this minimalist painting U.S. artist Agnes Martin (1912-2004) covers a large square canvas with a white acrylic ground. Over the top she’s drawn a fine grid of graphite and red pencil lines. 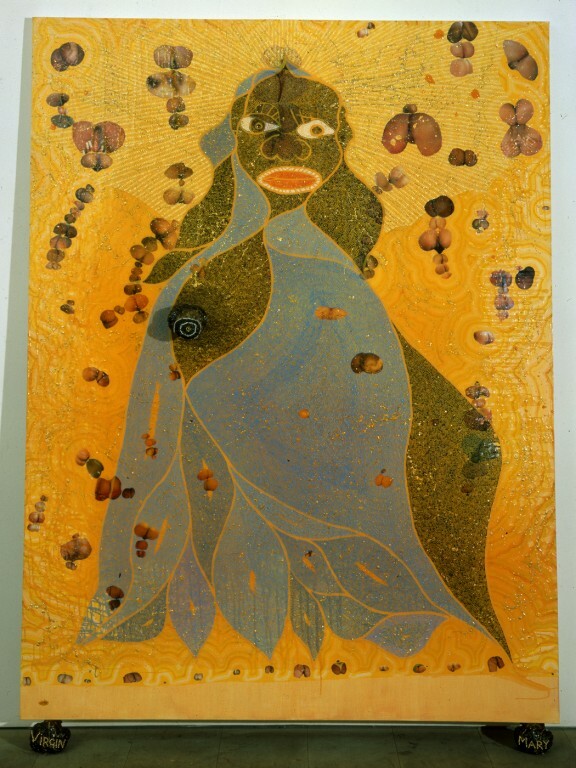 In The Holy Virgin Mary (1996) English painter Chris Ofili (b.1968) exploits the stickiness of acrylic, which can be applied to all kinds of surfaces. This controversial work is a multi-layered mishmash of imported materials (paper, oil paint, glitter, elephant dung) all glued and sealed tight together by acrylic. 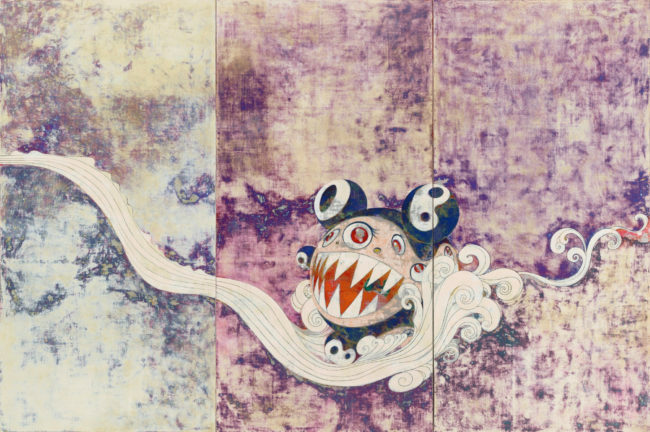 In this painting (called 727-727) Japanese artist Takashi Murakami (b. 1962) showcases the different effects he can achieve with acrylic paint. 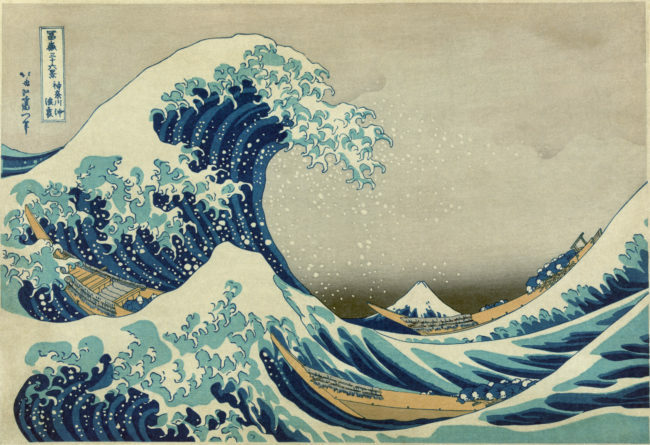 Here the artist’s signature cartoon-like creature MR. DOB (inspired by animated film and comic book characters) is carried on a curl-crested wave that suggests the well-known woodblock prints of the Japanese artist Hokusai (1760–1849). So acrylic can be used to delineate fine detail. It can also be used to create a more blotched and faded effect: in the background multiple layers of paint have been built up and then scraped away to create an abstract look. In the 1960s David Hockney (b.1937) moved to Los Angeles and made a switch from oil paint to acrylic. His paintings of the carefree southern Californian existence of green gardens, blue pools and beautiful boys have a flat and graphic feel to them. A Bigger Splash (1967) is a good example. Here Hockney paints the pool of a Modernist Californian home. The sense of stillness is reinforced by strong horizontals and verticals in the composition. Hockney created the straight-edged shapes by masking-taping the canvas and applying the acrylic paint with rollers. 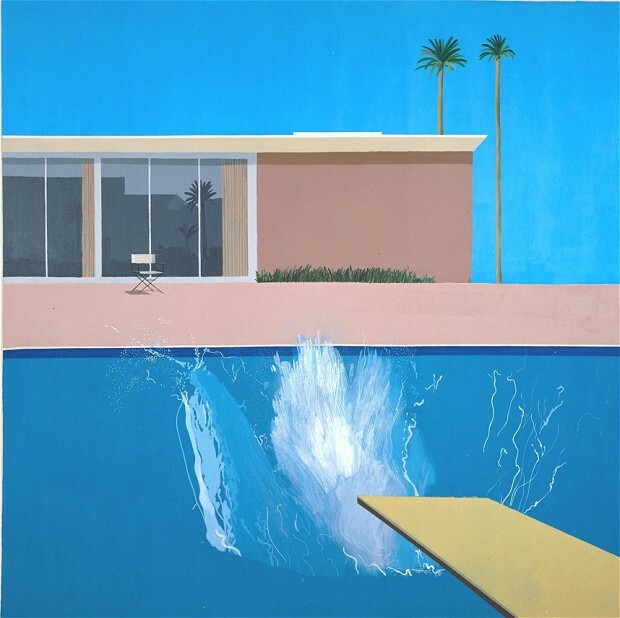 The surprise of the splash contained in the tight arrangement shows Hockney’s graphic leaning. The quick drying time of acrylic makes blending difficult in comparison to oil. In this sense Hockney uses the medium in its purest from, creating an almost surface-pattern effect. Adding to this is the fact that acrylic is flat in terms of its light absorption: it doesn’t glow like oil. 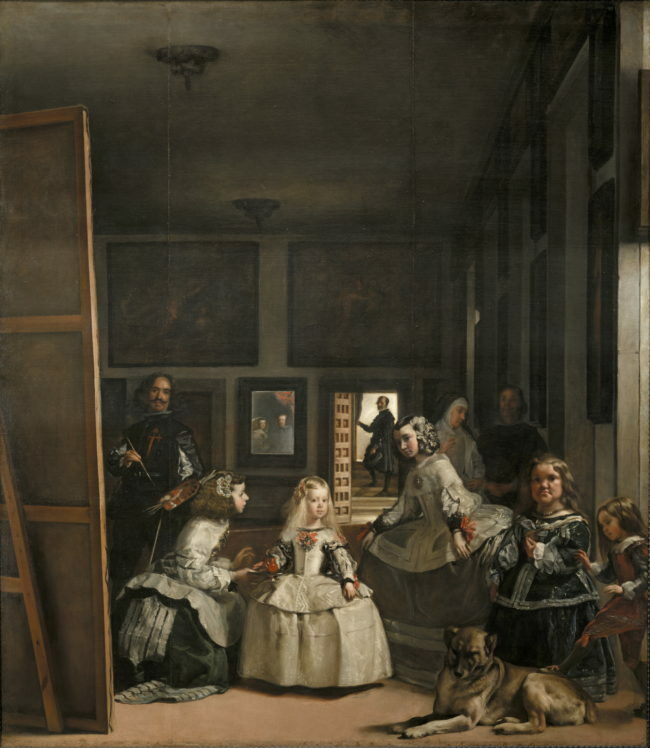 In this famous work the Spanish painter Velázquez renders the effect of form in terms of light and shade (chiaroscuro in Italian). One of acrylic paint’s possible limitations is that it does not allow for easy modelling in light and shade because it dries so fast. 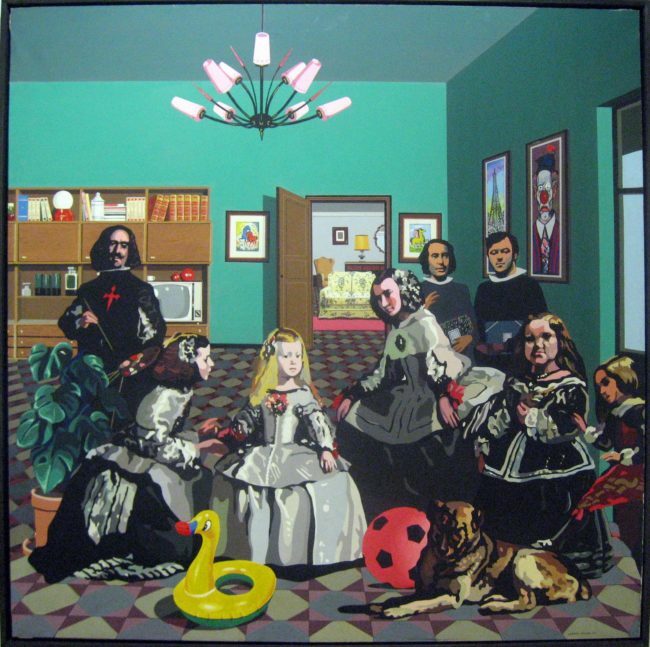 This is another version of Las Meninas (1970) made by an artistic collaboration called Equipo Crónica. 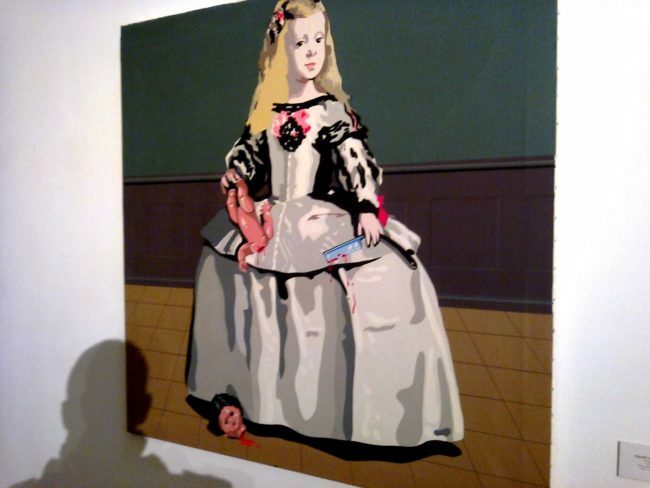 This group reconfigures and revisualises works from the art historical canon for a modern audience. 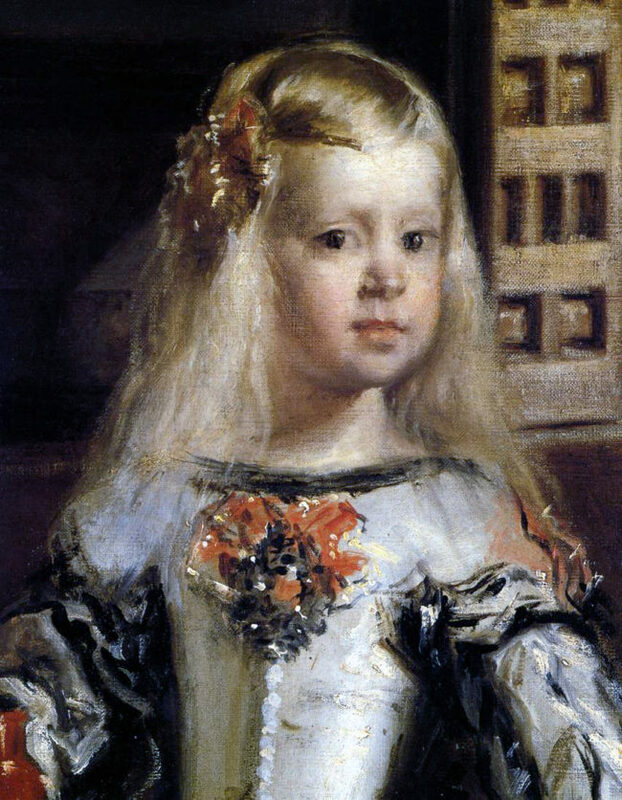 What’s interesting for us is that where Velázquez’s oil paint makes possible a range of tones from very dark to very light, acrylic can’t create that effect. So the modern-day version has passages of unblended colour creating form. As I suggested at the start, acrylics literally changed the face of painting.